Kingston melds reggae, pop, hip-hop; he calls it "hip-pop"
NEW YORK (CNN) -- Sean Kingston was talking about his hit song "Fire Burning" when his cell phone suddenly started to ring. The device blasted a familiar tune. Sean Kingston has one of the summer's hottest hits with "Fire Burning." She's fire burning, fire burning on the dance floor. Wait a minute. His own song is his ringtone? "I've got to support it, man," said Kingston, 19, with a cheeky smile. "It goes right back in my pocket, but hey." There had better be plenty of room in those pockets. "Fire Burning" is shaping up to be one of the summer's hottest tracks, with more than a million downloads sold, and is the second best-selling song on iTunes this week. For mainstream radio listeners and nightclub goers, the reggae-trance track is inescapable. "Three days ago I was in an elevator," he said. "A lady came in and she had her iPod and she was playing my song. She didn't know who she was standing next to. That was kind of funny." But hearing his music in public doesn't mean he's allowed to get too cocky, he said. "It actually motivates me to make even more music, because that's kind of big. Coming from where I'm from -- coming from nothing -- it's just amazing to hear people react to my music like they do." The Miami-born artist, whose real name is Kisean Anderson -- he changed his name to Kingston to reflect his Jamaican heritage -- got a taste for the big time in 2007 when his debut song "Beautiful Girls" became a No. 1 hit in the United States. His sophomore album, called "Tomorrow," comes out September 22. Kingston just wrapped filming in Los Angeles for the music video for its second single, "Face Drop." Kingston dropped by CNN to share his thoughts on his abilities on the dance floor and the leading ladies of pop. The following is an edited version of the interview. CNN: How much time do you actually spend on the dance floor? 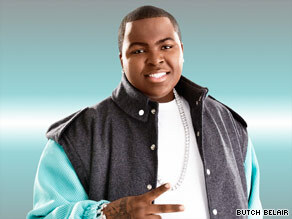 Sean Kingston: I spend a lot of time on the dance floor, [though] ... I'm more the type of dude to sit back and pose and act cool. But I had to make a song for it because there's a lot of stuff that's going on in the world today ... people want to dance. People want to let loose and "Fire Burning" is a song that you can do that to. CNN: You were born in Miami. You grew up in Kingston. Then you moved to L.A. Where do you feel most at home? Sean Kingston: I feel really at home, I can't even lie, in Miami. Because it's just like I know a lot of people, my friends that are there. That's where I started doing music when I was in Miami. CNN: Why call your sophomore album "Tomorrow"? Kingston: Because I feel like it's so futuristic. I felt like my last album was yesterday. Nobody's going to be able to expect what Sean Kingston is bringing on this new album. CNN: The first track that came off the new album was a collaboration with Lil' Wayne. It didn't take off like your previous hits. Why do you think that is? Kingston: We never sent it to radio. That record got leaked. It got leaked from the Internet and we just kept it going. But it never really got that push from the label. But I mean it did good. I mean 4 million plays on YouTube, 3 million on MySpace. Sometimes you've got to give free music to get people to pay attention and to build a buzz. So I basically gave my fans free music. CNN: You collaborate with punk-pop band Good Charlotte on the album. The whole "Tomorrow" album ... it's ridiculous. I feel like it's going to be the album of the year. I feel like it's my best album that I ever made. It's way better than the first one. CNN: Do you feel like you've pioneered this new sound that combines reggae and hip-hop and other elements? Kingston: I definitely think that's my own style. I definitely think I came in the game and I got my own blend. I've got something that I call hip-pop, not hip-hop. And a lot of people are starting to use that now but I feel like it was my fusion. CNN: Is it fair to say that "Beautiful Girls" brought massive change to your life? Kingston: It did. It changed my life like that! No other song did it but that song. I'm blessed. CNN: Are you surprised that it only takes one hit song to make someone a huge star? Kingston: It didn't really quite take me one. It took me one to get in the door. And then it took having a Top Five record. But you've got to understand ... in this music business, there are so many one-hit wonders. You could have a hit, but it's like "OK, could you follow up?" So it's not about what your past is, it's about longevity. CNN: You've been the opening act for Gwen Stefani and Beyonce. Who are some other female musicians you admire? Kingston: Man, those two are amazing. Gwen Stefani! That's what you call a star right there. Just to be in her presence ... I learned a lot from her. She's just amazing. Beyonce too. I like Mary J. Blige. Rhianna! I met her a lot of times and she's down to earth. She's so cool. And she's an island girl. And I'm an island dude, and we gotta hold down for other people.